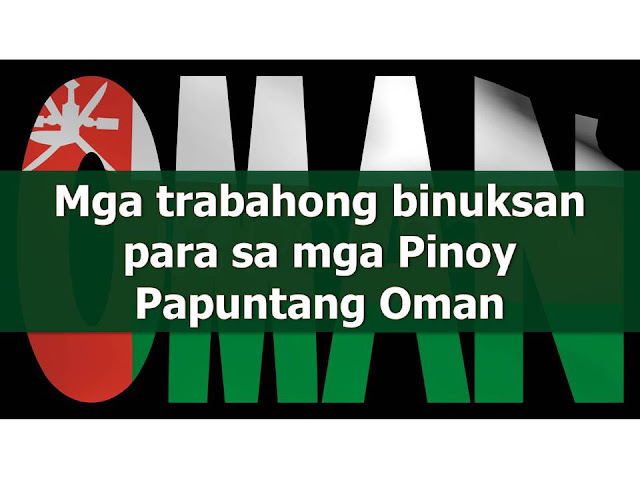 Hundreds of jobs are now open for Filipinos who want to work in Oman. They are hiring nurse, engineer, salesman, waiter, welder, technician, operator and other jobs for skilled workers. We are not affiliated to any of these agencies. The information provided here are from POEA and is meant to be guide for all the job orders approved for the licensed agencies by POEA. We encourage applicants to be cautious when dealing with any recruitment agency and report to POEA any violation on recruitment process. There should be no placement fee for domestic worker jobs. While for other jobs, placement fee should not exceed the one month equivalent salary. Placement fee should only be collected after signing the work contract. The following jobs are approved by POEA. Please be reminded that we are not a recruitment industry or we don't have any relation to the agencies mentioned here below. All the job orders was taken from the POEA jobs order website and was only linked to agency details for easier navigation for the visitors.